The Piston Heads Auto Club of Bowie presented its 15th annual Jim Bowie Car Show on March 31 at Pelham Park. The show was a huge success and crew a large crowd of car lovers who admired all the beautiful classic and new cars, truck and motorcycles. There were 146 entries, which was a record for the event. 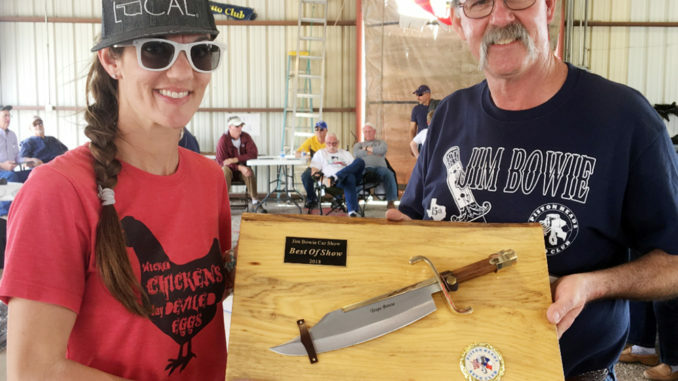 The Jim Bowie Car Show moved from June six years ago due to the hot summer weather and the temperature was perfect for Saturday’s event. Best of show went to Addison and Jessica Augusta from Cache, OK for their red 1956 Ford F100. See all the results in your weekend News.